Of course, we need to do better and have much more work to do. But we’ve made some strides in diversifying our workforce: last year, 41% of new employees were women, which is 5% more than the proportion of women in our overall employee population. Similarly, we hired 3% more Black and 2% more Hispanic employees compared to our overall employee base. In addition, we’re ramping up our presence at recruiting events around the country and our outreach to Historically Black Colleges and Universities (HBCUs) and Hispanic Serving Institutions (HSIs). And today, we’re committing $3 million over the next three years to support organizations working to bring more women and underrepresented groups into tech. Employees will be crucial in deciding which organizations we partner with. Of course, diversity goes beyond technical roles—or race and gender. At Uber, we connect people and things in the real world, so our operations and support employees are core to our business. On these teams, we’re moving in the right direction more quickly, as well as in other key functions like People Operations, Legal and Policy & Communications—all departments run by women who sit on our management team. We’re also proud of the work we’ve done to create an inclusive environment for people from the LGBTQ community, earning us a top score of 100 on the Human Rights Campaign Foundation’s 2017 Corporate Equality Index, which deemed Uber one of the “Best Places to Work for LGBT Equality.” No matter where you come from—and 15% of our U.S. employees have work visas, immigrating from 71 countries—we want you to know that you have a place at Uber. And we will continue to speak out against discrimination. We’ll also be getting advice from diversity and inclusion experts, and from others in the tech sector who have been working on these issues for longer than we’ve been around—and who are working to make change happen. We’ll keep you updated about what we’re learning and, importantly, how we’re implementing the great ideas we hear about. 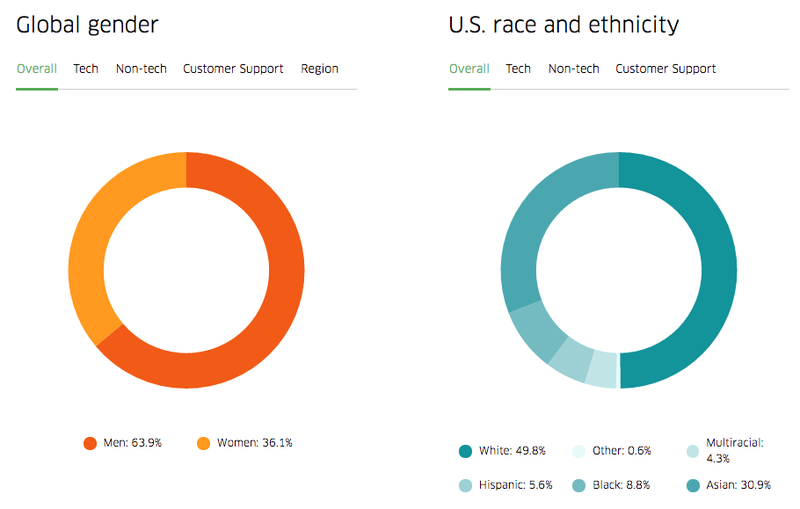 Learn more about our efforts and see the data we’re releasing today at uber.com/diversity. We also know that numbers only tell part of the story, so we asked a few of our employees from around the world to share, in their own words, what Uber means to them—and what they want to see going forward. You can read what they had to say here.